“Footloose” cast members, Uzziah DeLaCruz, Christian Cantu and Monica Betz rehearse for Wauseon High School’s production this weekend. 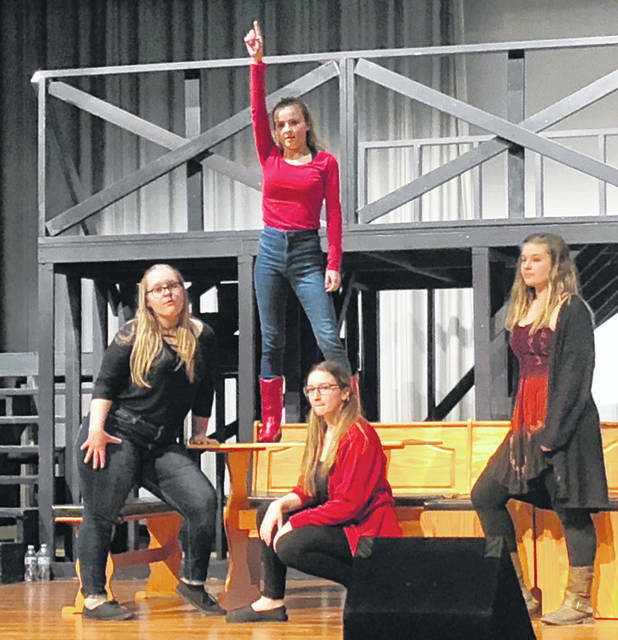 The infectious energy of an ’80s feel-good movie will kick up its heels across the stage this weekend at Wauseon High School. 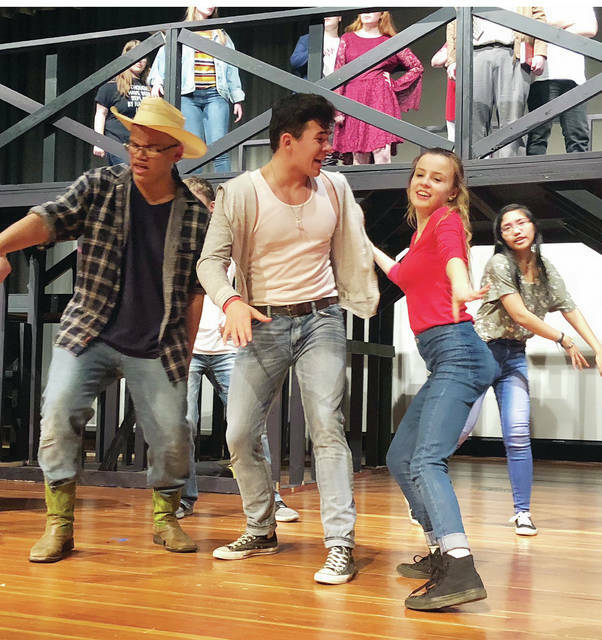 The musical version of “Footloose,” a modern David and Goliath story that pits a music-and-dance loving high school student against the severe conservatism of a Midwestern town, will be held March 29-31 in the school auditorium. Director Jason Robinson said it’s a high-octane production that captures the essence of the original film but offers a few surprises. “It’s been a long time since the school has done a high-powered choreography show. This one allows that,” he said. Performances of the two-hour musical will be held Friday, March 29, and Saturday, March 30, at 7 p.m., and Sunday, March 31, at 2 p.m. Admission is $10. The musical stars WHS seniors Christian Cantu, Monica Betz, and Hunter Mattin. James Vaughn is the musical director, Don Clark is the orchestral director and technical supervisor, and WHS graduate Julie Kahrs is the choreographer. The story follows Ren McCormack, a Chicago teen who relocates with his mother to a small Midwestern town following the death of his father. Immersed in the big city music and dance culture, Ren is appalled to find that the elders in his new community have outlawed rock music and dancing. They’re led by Rev. Shaw Moore, a rigid authority figure whose teenage daughter, Ariel, rebels against his grim virtuousness. Ren decides to fight the ban, and along the way contends with fitting in, facing the school tough guys, and his romantic feelings for Ariel. The 1984 film starring Kevin Bacon, Lori Singer, and John Lithgow, which opens to a medley of dancing feet, earned $80 million worldwide. It spawned the musical Broadway version in 1998, and a movie remake in 2011, and produced an album of pop hits from the era. Much of the adult content from the movie and Broadway versions has been edited from the WHS production to make it more appropriate. A cast of approximately 35 students has rehearsed since January. Robinson said “Footloose” was chosen to appeal to high school students and as a way to expose younger children to theater. He said it should also conjure fond memories for adult audience members who grew up with the original movie. The musical’s singing and dancing sequences proved a challenge. A bass in the school choir, he sang tenor for his role and practiced to hit the higher notes. He plans for a career in business or marketing, but if the opportunity to perform presented itself “I would take it in a heartbeat,” Christian said.